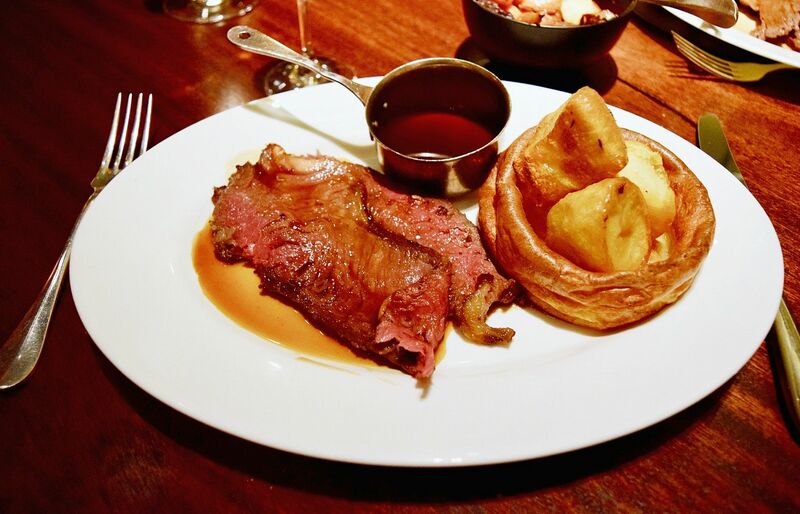 Sunday Roast Lunch At Quaglino's With Bottomless Prosecco! 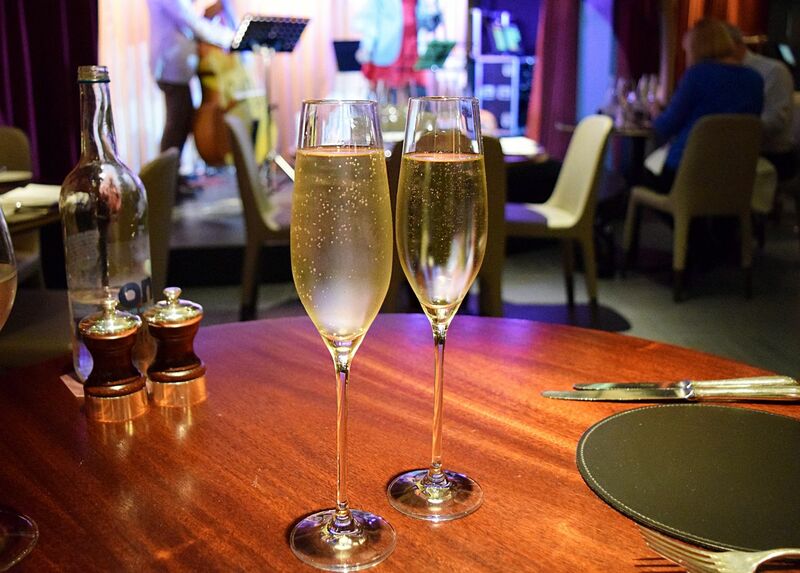 Paula and I love a Sunday lunch in London and when we heard about Quaglino’s two and three course offering, complete with bottomless Prosecco and live music. We knew straight away we had to try it! 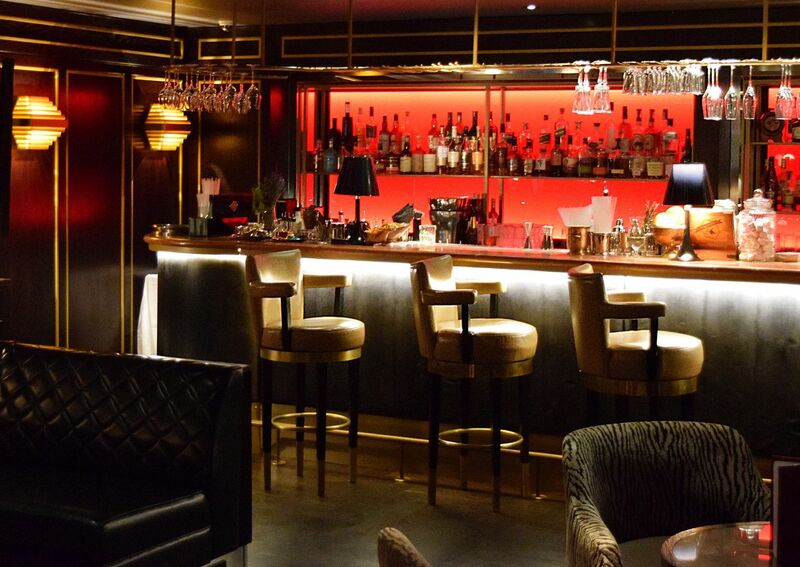 Quaglino’s is nestled away on Bury Street, near Piccadilly Circus. As you walk in you walk down a small flight of stairs to reception, where already you start to be enticed by the smells of food and the sight of the grand restaurant. We were met by the maître d’ who took our coats and led us through the upstairs bar to a long set of stairs where you see the vast but very impressive restaurant downstairs. As we were being shown to our table you would be forgiven thinking you were entering a grand dining room from the 1920’s. The restaurant is open plan, with a large number of tables placed around a huge bar in the centre of the room, the tables are a good size for couples dining but also easily accommodate larger groups. Paula and I decided to go for the three course Sunday Roast option, which is £29 for three courses and we also chose the bottomless Prosecco to accompany our lunch, which is an additional £20 per person. There is also an option of two courses for £25. We were swiftly brought a bread basket and as I mentioned there was live music on the stage at the end of the dining room, where we were treated to a live jazz band. 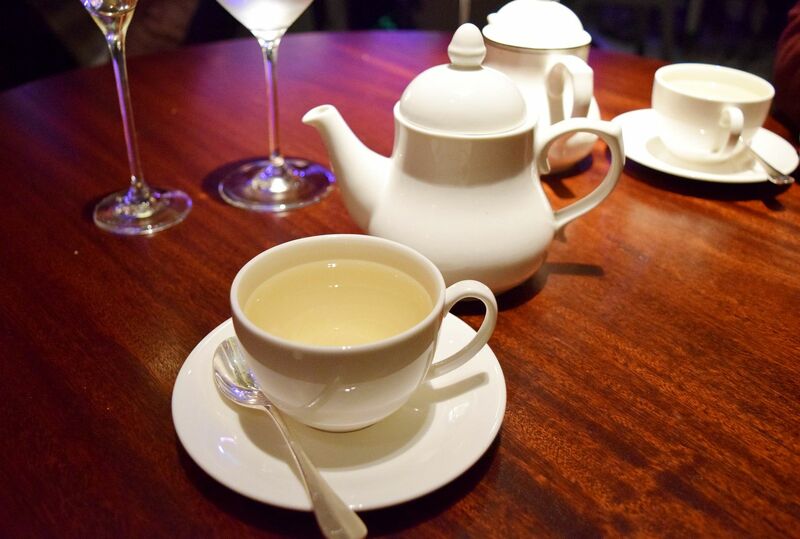 We sat back with our glasses of fizz listening to jazz covers of Amy Winehouse and current chart classics. 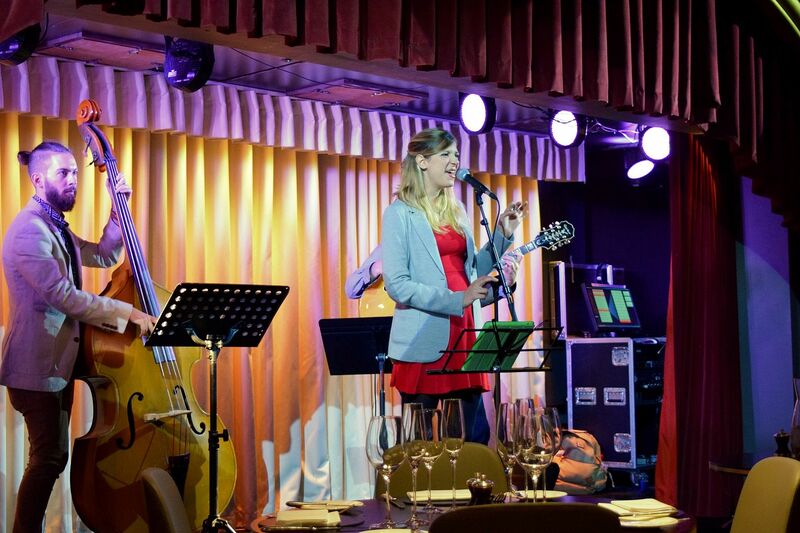 The music is a new addition to Quaglino’s and is free to enjoy throughout your lunch. Many of the diners clapped and appreciated the jazz trio throughout their performance. 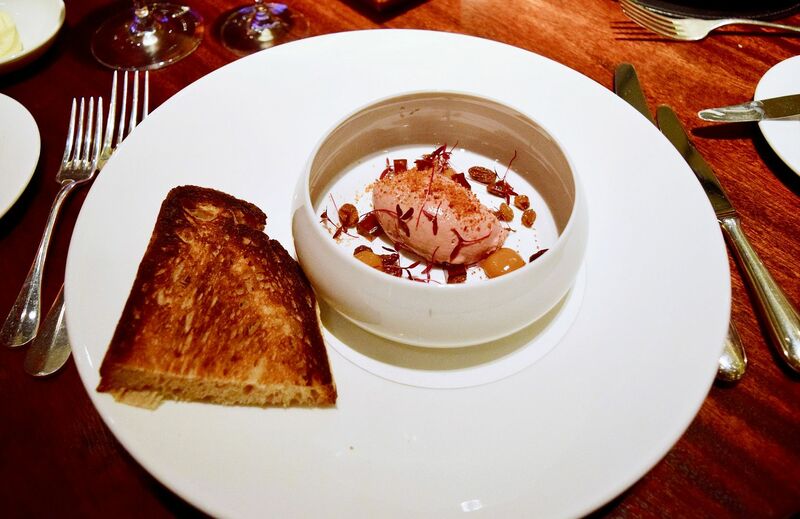 The starters were brought out in good time and Paula chose the chicken liver parfait with quince jelly. The parfait was really lovely and blended into a very smooth parfait rather than a courser more pate like texture that some restaurants offer. Unlike some parfait we have had recently, it did not have too strong a taste, so this worked well with the delicate jelly squares and the griddled piece of thick cut sourdough toast that was slightly charred. It was a good starter and I ended up having some of the parfait with some of the bread we had left over. I chose the harissa and peanut roasted aubergine with whipped coconut, buckwheat, black quinoa and lentil tabbouleh. This was a good-sized starter that went really well together. The roasted aubergine was particularly soft and topped with a slightly spiced harissa that tasted great. The whipped coconut went particularly well with the spicy aubergine and cooled the heat undertone. 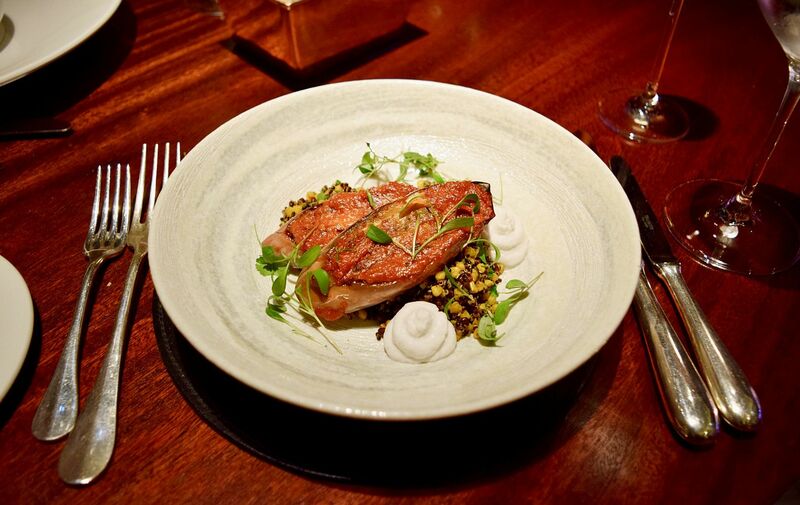 The light mix of buckwheat, black quinoa and lentils were flavoured really well and left me ready for the main course. One thing to note was the waiting staff were very attentive, they constantly topped up our glasses with water and Prosecco, as well as offering their help and advice with the menu. Even when the mains were taking a little longer than you might expect they came over and explained the slight delay of being busy and that there was a large function upstairs. For main course, I had built up quite a taste for lamb from the previous nights tapas meal, so I opted for the roast leg of lamb. The roast lunch was a good portion of sliced lamb, which is served slightly pink, and accompanied by all the usual trimmings, a large Yorkshire pudding, four crispy but fluffy on the inside roast potatoes and sweet roasted root veg and a good amount of gravy. The lamb was lovely and tender, with a strong lamb flavour. 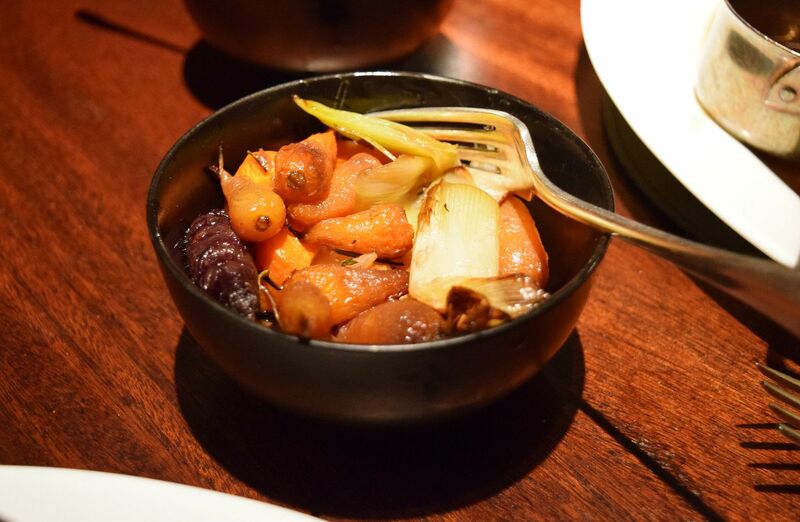 The roast went really well together and I was a real fan of the roasted veg. Paula decided to choose the roast beef sirloin for her main. The beef came blushing, if you are not a fan of a rare steak or roast beef, I would recommend speaking to the waiting staff to ensure yours is cooked for slightly longer. The beef itself was good, seasoned well, very juicy and was a good cut of beef with a number of slightly thicker cut slices. Traditionalist roast fans will appreciate the meaty gravy it came with and how the roast all went well together. Even at your hungriest you might struggle to finish the portions, it’s a lot more food than at first glance. I tried both meats and I would happily go back for both again. The dessert menu had a number of different options and caters for puddings to the cheese lovers. Not breaking tradition; Paula and I went for very different desserts, Paula ordered the lemon meringue shortbread which she got pretty excited about it after seeing it on the menu. It was one of the prettiest served desserts and the lemon meringue had a sharp lemon taste that went really well with the sugary crispy meringue and was served on a bed of shortbread. 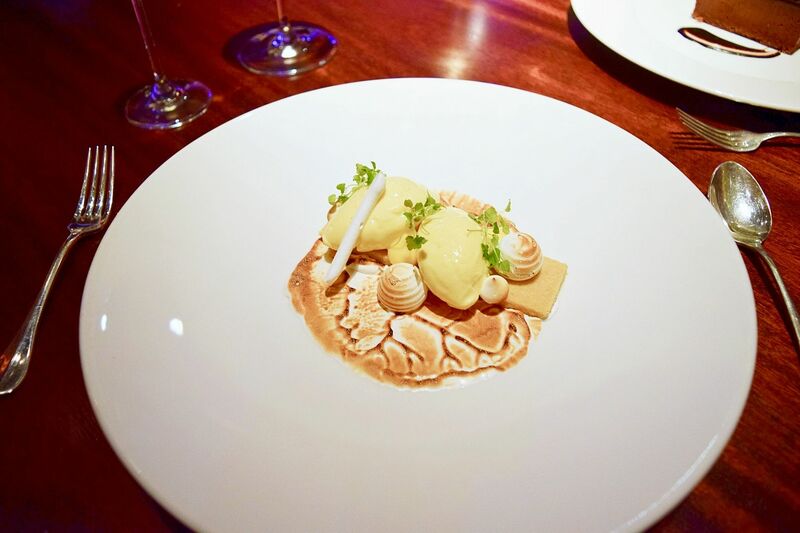 It is a dessert lovers dream. 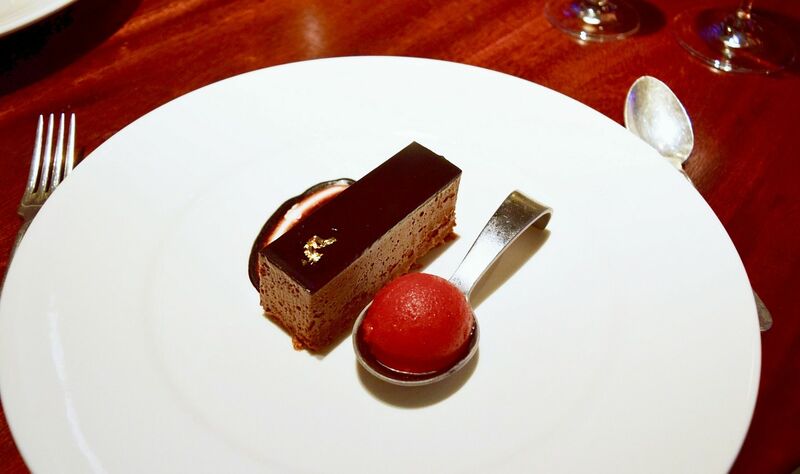 I went for the dark chocolate marquise, if you love dark chocolate and rich desserts you will really appreciate the bittersweet dessert consisting of dark chocolate, light mousse and ball of light raspberry sorbet. The intense and glossy dark chocolate top went really well with a lighter and sweeter mousse and light sorbet ensured it went down smoothly. It was a very good dessert to finish off a filling three-course Sunday Roast. We finished off our dinner with fresh meat tea and enjoyed the music. I would definitely recommend a visit to Quaglino’s. 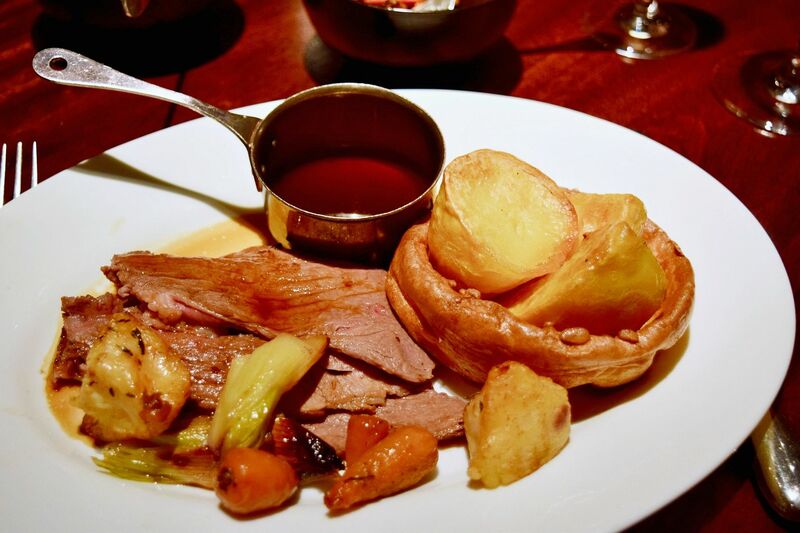 A fair priced Sunday lunch, with filling roasts and a bottomless Prosecco option, in a lovely venue in London with good waiting staff, what more could you ask for? 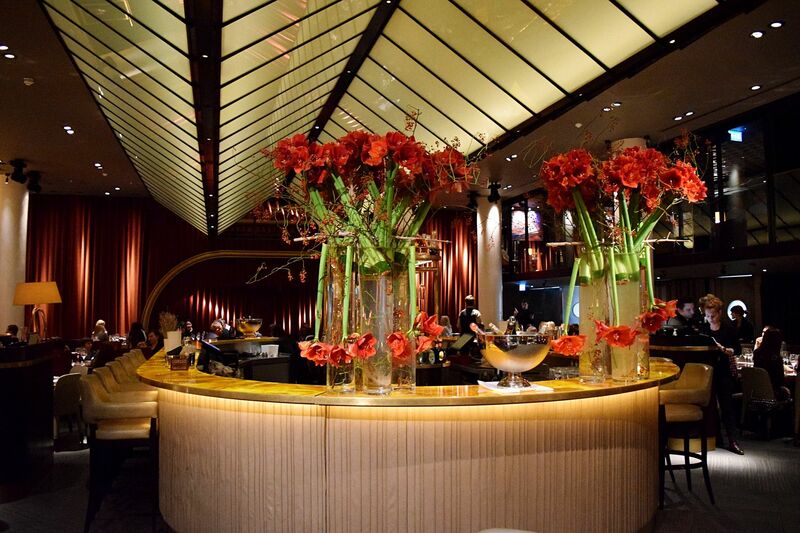 For more info or to book a table for the weekend, visit Quaglino’s.